Thank you. Your request was sent. A retreat specialist from Bali Soul Adventures will call you as soon as we receive your request as long as it is between 8:00 AM and 8:00 PM Bali time. If we receive your request outside of those hours, we will attempt to call you at a reasonable hour the following day. Discover your spiritual connection Awaken to who you really are... Find yourself in Bali! We understand that when you visit a web site, you like to have readily available all relevant information about the product or service. Obviously pricing is a very important consideration and we want to make it easy for you to receive that information. Because every retreat we design is personalized with different sessions over differing lengths of time, our pricing must be personalized as well. We are only able to provide you with an exact quote once our retreat specialist has met with you by phone, discussed with you your individual situation and retreat goals and created, at no cost or obligation to you, a retreat proposal. At that time the exact price in US$ is included in your 3 to 5 page retreat proposal. How can you request a phone call from our retreat specialist to get the ball rolling? You can click the gold ‘We’ll Call You’ button at the top of the page and fill in the requested information. You can also click this email link: CallMe@BaliSoulAdventures.com and provide the requested information and if you’re in the USA or Canada, you can call the toll free number at the top of the page. Maybe you don’t feel you’re quite ready to have a conversation with the retreat specialist but you would still like to get a feel for what the investment in your retreat might be. We can help with that too. You can request a broad pricing estimate by clicking this email link: Pricing@BaliSoulAdventures.com and providing the requested information. This pricing information is only a general estimate and your specific proposal will likely be different. Also, our pricing necessarily changes with fluctuations in the currency exchange rates. 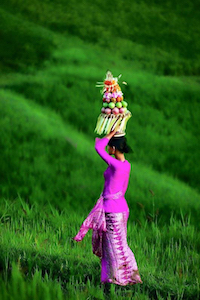 Bali Soul Adventures’ retreats are powerful, transformational, life-changing experiences. In part this is because they are designed for you personally based on your unique situation and needs. It is also because all your Bali Soul Adventures retreat sessions and healing experiences are private individual, one-on-one events completely centered on you. As you can imagine, this setting and context is much more powerful, focused, efficient and ultimately productive than a group retreat with one presenter before a group 10 to 20 participants. With a Bali Soul Adventure you go very deep and get a lot done in a relatively short period of time. Consequently, all this individual attention is a bit more expensive. A 7-day Bali Soul Adventure will cost more than most (but not all!) 7-day group retreats with a one-size-fits-all program. How many programs in the past have you participated in that felt good at the time but ultimately had little impact on the frustrations and negative patterning in your life? The real question is value for the money you’re investing in your retreat and in yourself. Will the result of your retreat be powerful, positive and permanent changes in your life? The most common reports we receive from our Soul Adventurers 6 months, 12 months and even years later, are that their Bali Soul Adventure was transformational and life-changing – often times a turning point in their life.